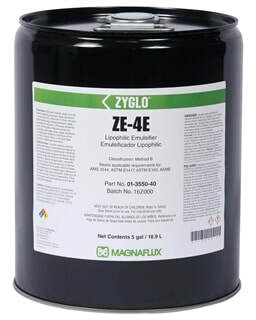 A Method B lipophilic emulsifier, ZE-4E diffuses into the penetrant to clear the penetrant from the surface of the part being inspected. It is rinsed from the part by water, carrying penetrant off the part surface. Designed to be used with post-emulsifiable penetrants Level 2 ZL-2C, Level 3 ZL-27A or Level 4 ZL-37. Benefits include low volatility and a high flash point, so ZE-4E can be used in open immersion tanks. ZE-4E is listed on the QPL SAE AMS 2644 Qualified Product List.